Getting to Oshkosh over the past few years has been very trying for us. One thing after another got in the way. A few days ago, it looked like we'd be foiled again. Thanks to family though, we were able to get things back on track. Arriving around noon today (Monday the 20th), we were very surprised. Having been many times, it was hard to believe the place was full. Campers were already out to the entrance and the plane parking appeared to be near capacity. I'm not sure I've ever seen that on Monday. Something is definitely in the air this year as today felt like the typical Thursday where things are in full swing. Whatever the reason (my guess is cheap fuel), there's no question this place is hopping. Looking around as we walked to the first point on our "to-do" list, we were amazed by the crowd. Both people and planes were unusually abundant. It was the kind of crowd where it's hard to find your friends. 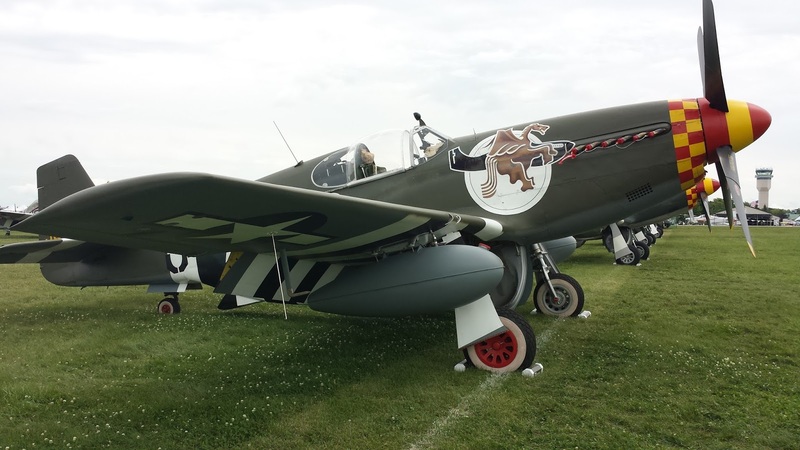 Yet, within minutes of stepping into warbird territory we had run into Harold Cannon, caught up with Mike Porter, chatted with Adam and Alex, and talked to the man we had come to see about a plane. Then we started looking around. The year of the Pitts. If you're down that way, there is an amazing collection of Navy warbirds this year. The collection of bombers is impressive also. 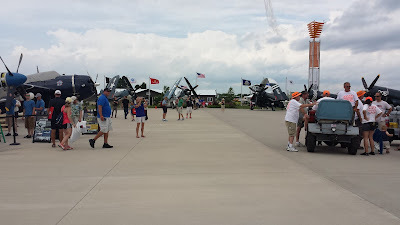 Again, I'm not sure why the great showing, but it is a great year to visit the warbird camp. Go take a look. Did I mention the Mosquito? 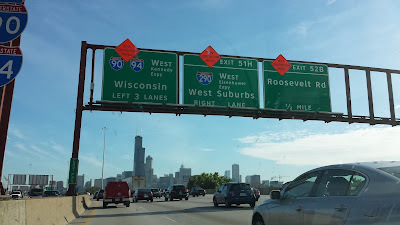 Amazingly, we barely even made it to the vintage area today. Running into one person after another, and one great plane after another, we found ourselves to be worn out by the time we walked up to Ron Alexander at his DC-3. Some people you never tire of talking to and Ron is one of them. It was from there we went for our second small meal of the day at the Vintage Café. Here I have to point out one thing that many may not experience but we couldn't help but notice. A few years back the Vintage Café was great. Today they no longer have the good coffee and they have nothing healthy to eat. I guess it says something about the different crowds. 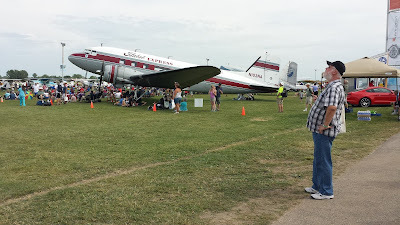 In the warbird area we were able to get food that wasn't full of sugar or wrapped in a giant bun. Not so at the Vintage Café. This was a definite disappointment. From that point we intended to head to the car but ran into another friend, John Patterson. He and his son had flown their WACOs up together and it was obviously a proud moment. John couldn't help but smile as he talked about it and it made us smile too. Saying goodbye, we took five steps and ran into Steve Koerner and stopped to talk. 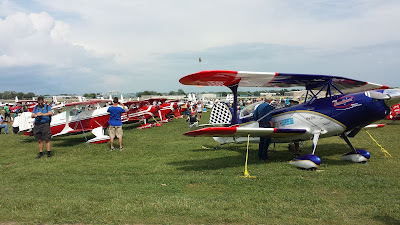 Then, although we were both pooped, we swung by to say hello to Mike Rosman and the rest of the members of his aviation gang. And I had to say hello to Eric Presten. Hey look, there's..... We'll have to catch them tomorrow. This is how Oshkosh goes for us, and probably you too. We head for the car around noon and reach it around six. But that's how it should be. If our luck holds out, we'll run into each and every one of you before we leave.